Author: Miking98 | Last modified: July 3, 2018, 11:23 p.m. The room for a debate must be set up to accommodate two teams of three (the PRO and CON), a judge, a timekeeper, and whatever audience there might be. The CON team generally sits on the right while the PRO generally sits on the left side of the podium. 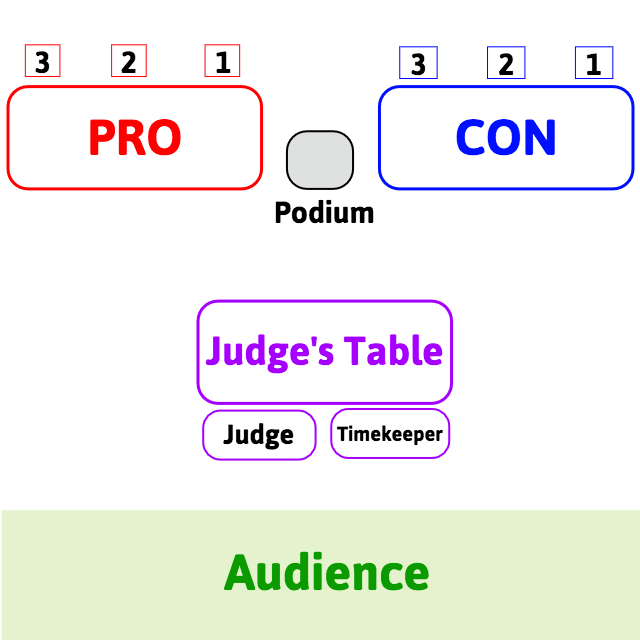 The judge and timekeeper are situated a few feet in front of the podium while the audience sits far back to ensure that there is no audience interference in the debate. This layout ensures that distractions are minimal for the debaters. The speakers for each team generally sit in the order that they speak, starting with the 1st speaker sitting closest to the podium, and so on.